← Wetsuits are Supposed to be Faster? As competitive athletes, it is easy both to forget and to take for granted the process of learning the basics of our sport—even such at-the-time-harrowing experiences as learning to ride in clipless pedals. This past Sunday Ayesha and I had the pleasure of revisiting a number of the elements of riding we now consider second nature. In slowing down and calling attention to the fundamentals of cycling we were able to appreciate how much the sport has become so much of who we are and how we navigate the world. 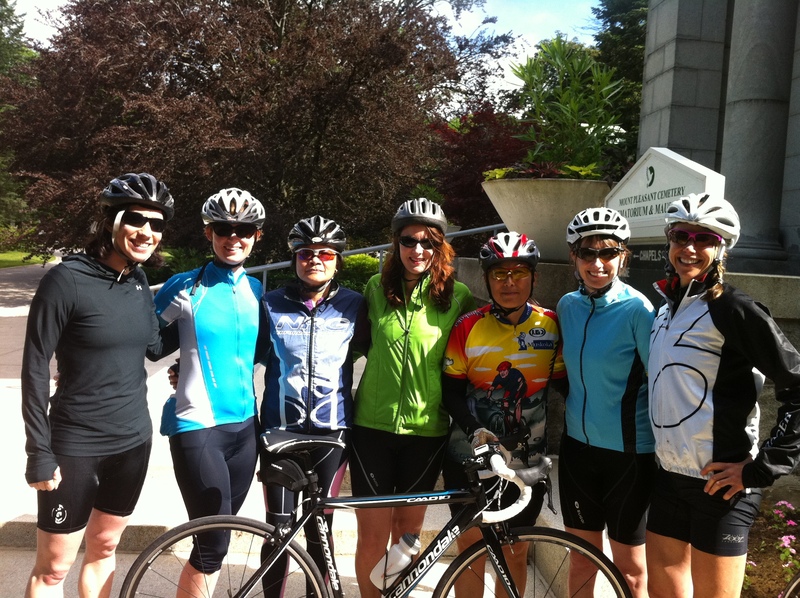 Sunday marked the 2nd of a 4 part bike skills clinic specifically for women put on by Trek Toronto. This is the first year it has sold out and we had a great group of women on Sunday who all went through the handling and dexterity drills with success. It was really fantastic to see their confidence build on the spot—with each corner they took, and with each clipped in pedal stroke—independence, autonomy and power expanded exponentially. In the clinics we aim to demistify the techy-gear-based aspects of riding—to make the components of the bike and the multidimensionality of cycling accessible in everyday parlance. Ayesha is amazing at this as her engineer’s brain can construct and deconstruct the anatomy of the bike as it relates to her expansive knowledge of human anatomy. When one understands how and why exerting pressure on the hood or the pedals, or how and why we must angle our body positions in cornering for example—things begin to feel less daunting and infinitely more doable. One of the most motivating things that happens at these clinics is the discussions and discoveries that the group undertakes. The questions – which are often and unecessarily preceeded by "I should know this but" – are amazing. Each question inspires follow-on questions from the women in the group. 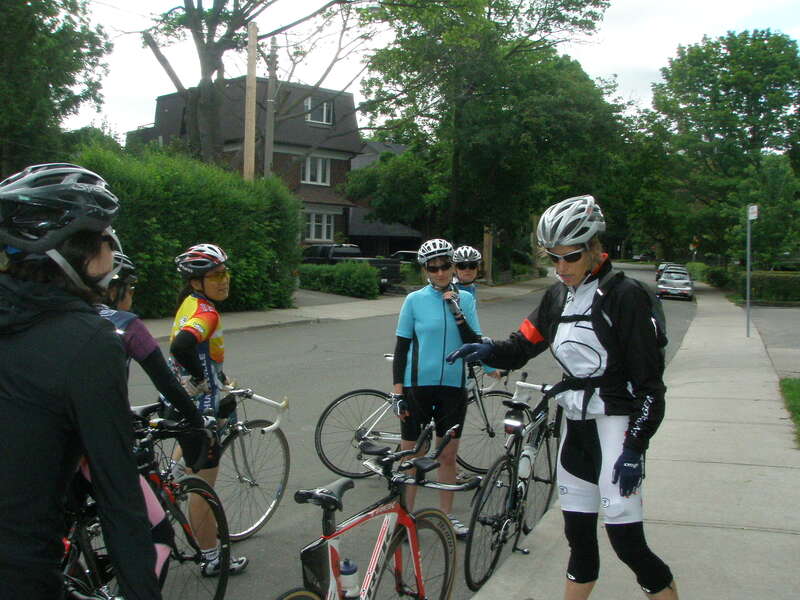 Questions like "why do my gears make a funny noise when I put it in certain positions" were answered and followed by a great back-and-forth about bike mechanics, gear choices and compact cranks. 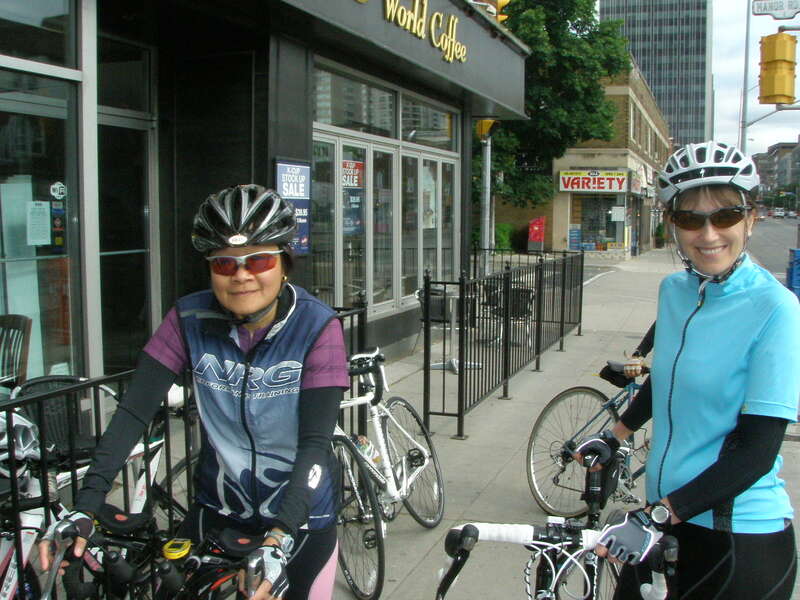 We had a blast and of course, any ride that begins with an Americano is filled with extra joy. Here we are getting some caffeine before heading out! Great job ladies—looking forward to the next one.